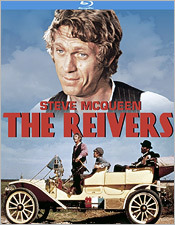 Mark Rydell’s 1969 dramedy The Reivers is old-fashioned in both good and bad ways. The story of a trio of unlikely companions who “borrow” a valuable car and take it on an episodic road trip, it’s a family film in the truest sense, in that it’s designed for all ages to enjoy, not for parents to merely tolerate. (It does have a lengthy detour to a whorehouse, but the material is presented in such a sanitized, stylized fashion that it does little to counter the pervasive sense of innocence in the piece.) Rydell, making his second film here before going on to hits like The Rose and On Golden Pond, directs with a consummate sense of professionalism; the movie feels less of its time (the era of Peckinpah, Easy Rider, and Bonnie and Clyde) than it does the last gasp of the classical era – both in terms of its style and its values, it would have fit in with the studio output of thirty years prior. This has its advantages and disadvantages. On the one hand, the craftsmanship on display in The Reivers is exceptional; Rydell is a master visual storyteller, and his dynamic but subtle use of the frame to tell his story is timeless. The story itself, however, feels a little stale today. Set in 1912 and based on a William Faulkner novel, it follows the misadventures of Boon Hogganbeck (Steve McQueen), a chauffeur who takes his boss’s expensive Winton Flyer on a joyride. He’s accompanied by his boss’s twelve-year old son (Mitch Vogel), and his black second cousin Ned (Rupert Crosse). Together they experience a number of (mostly minor) adventures before mistakenly trading the car for a horse, which they then need to race in order to get the car back. It’s a mildly charming but slight tale, one that’s so slavishly devoted to its sense of period that it not only recreates 1912, it feels like it could have been made in 1912 (aside from the color and sound, of course). The movie’s dated quality keeps it from entirely working for modern audiences, though Rydell’s talent and the excellence of his cast compensates for the film’s weak spots. Crosse was rightly nominated for an Oscar for his work in the film, and McQueen is as charismatic as ever in the lead. Another Oscar nomination went to the superb score by John Williams, an early composition a few years before he would go on to massive fame with Jaws and Star Wars. Williams’s score is one of the main reasons to watch the film, and it’s beautifully served by the DTS-HD 2.0 mix on Kino Lorber’s new Blu-ray. The music sounds fantastic here, with every detail of Williams’s orchestration crisp and clear. The visual presentation is top-notch as well, with a wide range of vibrant colors in the period production design perfectly balanced against accurately reproduced skin tones. There are no special features on the disc, but as far as no-frills, movie-only releases go, it’s beyond reproach.